The conditions were bad for the Championships with a strong cross head wind. This was not a good start for the new Carrum course. Organising Committee: John Harry (Chairman), David Pincus, Steve Pennicott, Charles Bartlett, David Boykett, Robert Duncan, Chris Dane, Joe Fazio, Jim Lowe, Rod Maule, John Nickson, Tony Oakley, David O'Laughlin, Susie Palfreyman, Field Rickards, Michelle Saville & Bill Waterfield. 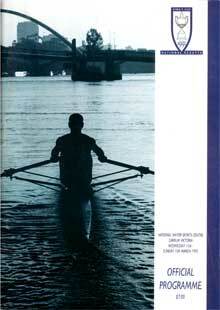 Boat Race Officials: John Burford, Barny Cundell, Jim Dowrie, Bryan Draper, Robert Duncan, Berry Durston, Steve Gillon, Andrew Guerin, Ray Hammon, Paul Harding, Duncan Harvey, James Harvey, Roy Hinchy, Steve Hinchy, Peter Huggett, Mike Leonard, Warwick Mahoney, Pat McGuffie, Reg McKay, John Murdoch, Ralph Murphy, Robin Murphy, Robert Pennington, Ron Podbury, R B Potter, Ron Richardson, D Swan, David Taylor, Martin Tomanovits, Shane Wood, Joy Wooldridge, William Wooldridge & Brett Woolfitt. 1st VIC - Bow: Peter Murphy, 2: Ben Dodwell, 3: Gary Gullock, 4: Matt McArdle, 5: Nick Green, 6: Michael McKay, 7: Andrew Cooper, Str: James Tomkins, Cox: David Colvin, Cch: Noel Donaldson, Emerg: Tony Johnston, Sam Patten withdrew with injury. Victoria led all the way for a comfortable win. There was a good race for the minor placings between WA and SA. Antonie from Victoria led for the first 1500 metres but Robin Bakker sculled better in the strong head conditions to take the lead and win comfortably by 5.62 seconds from Tony Lovrich from WA and Antonie a further 6.38 seconds further back. Victoria led for most of the way but was over taken by the fast finishing NSW crew who once passed, took a commanding lead. Queensland took the early lead but was over taken by NSW in the middle of the race. NSW then went onto win with Queensland second and Victoria third. NSW led from the start and consolidated their lead throughout the race. A superb race won by Pip Alder of WA by only 0.25 second after a marathon 9minute 52 second race into the head conditions. Victoria led from the start to win the Championships but only after a great tussle with NSW who finished 0.19 seconds back in a marathon 9 minute 12 second race. SA was the early leader with Victoria taking the lead from them by the half way mark and going onto win. There was a big margin back to the other crews.